Riga, is the capital and largest city of Latvia, a major industrial, commercial, cultural and financial centre of the Baltics, and an important seaport, situated on the mouth of the Daugava. With 713,016 inhabitants (2009) it is the largest city of the Baltic states and third-largest in the Baltic region, behind Saint Petersburg and Stockholm (counting residents within the city limits). 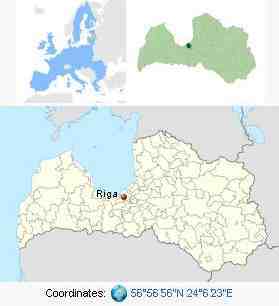 Riga's territory covers 307.17 km2 (118.60 sq mi) and lies between 1 and 10 metres (3.3 and 33 ft) above sea level, on a flat and sandy plain. The river Daugava has been a trade route since antiquity, part of the Vikings' Dvina-Dnieper navigation route to Byzantium. A sheltered natural harbour 15 km (9.3 mi) upriver from the mouth of the Daugava — the site of today's Riga — has been recorded, as Duna Urbs, as early as the 2nd century. It was subsequently settled by the Livs, an ancient Finnic tribe, later also the Kurs. Riga began to develop as a centre of Viking trade during the early Middle Ages. Riga's inhabitants occupied themselves mainly with fishing, animal husbandry, and trading, later developing crafts (in bone, wood, amber, and iron). The Chronicle of Henry of Livonia (Chronicle) testifies to Riga having long been a trading centre by the 12th century, referring to it as portus antiquus (ancient port), and describes dwellings and warehouses used to store mostly corn, flax, and hides. German traders began visiting Riga, establishing a nearby outpost in 1158. One theory for the origin of the name Riga is that it is a corrupted borrowing from the Liv ringa meaning loop, referring to the ancient natural harbour formed by the tributary loop of the Daugava. 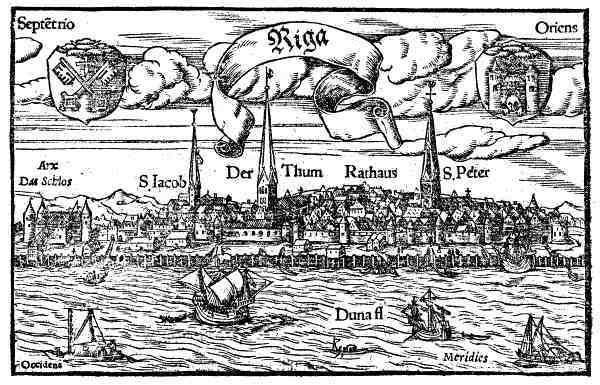 The other is that Riga owes its name to this already-established role in commerce between East and West, as a borrowing of the Latvian rija, for warehouse, the "j" becoming a "g" in German — notably, Riga is called Rie by English geographer Richard Hakluyt (1589), and German historian Dionysius Fabricius (1610) confirms the origin of Riga from rija. Along with German traders also arrived the monk Meinhard of Segeberg to convert the pagans to Christianity. Meinhard settled among the Livs, building a castle and church at Ikšķile, upstream from Riga, and established his bishopric there. The Livs, however, continued to practice paganism and Meinhard died in Ikšķile in 1196, having failed his mission. In 1198 the Bishop Bertold arrived with a contingent of crusaders and commenced a campaign of forced Christianisation. Bertold was shortly killed and his forces defeated. The Church mobilised to avenge. Pope Innocent III issued a bull declaring a crusade against the Livonians. Bishop Albert was proclaimed Bishop of Livonia by his uncle Hartwig of Uthlede, Prince-Archbishop of Bremen and Hamburg in 1199. Albert landed in Riga in 1200 with 23 ships and 500 Westphalian crusaders and 500 Westphalian crusaders. In 1201 he transferred the seat of the Livonian bishopric from Ikšķile to Riga, extorting agreement to do so from the elders of Riga by force. 1201 also marked the first arrival of German merchants in Novgorod, via the Dvina. To defend territory and trade, Albert established the Order of Livonian Brothers of the Sword in 1202, open to nobles and merchants. Christianisation of the Livs continued. 1207 marked Albert's start on fortification of the town. Emperor Philip's invested Albert with Livonia as a fief and principality of the Holy Roman Empire. To promote a permanent military presence, territorial ownership was divided between the Church and the Order, with the Church taking Riga and two thirds of all lands conquered and granting the Order a third. Until then, it had been customary for crusaders to serve for a year and then return home. Albert had ensured Riga's commercial future by obtaining papal bulls which decreed that all German merchants had to carry on their Baltic trade through Riga. In 1211, Riga minted its first coinage, and Albert laid the cornerstone for the Riga Dom. Riga was not yet secure as an alliance of tribes failed to take Riga. In 1212, Albert led a campaign to compel Polotsk to grant German merchants free river passage. Polotsk conceded Kukenois (Koknese) and Jersika to Albert, also ending the Livs' tribute to Polotsk. Riga's merchant citizenry chafed and sought greater autonomy from the Church. In 1221 they acquired the right to independently self-administer Riga and adopted a city constitution. That same year Albert was compelled to recognise Danish rule over lands they had conquered in Estonia and Livonia. Albert had sought the aid of King Valdemar of Denmark to protect Riga and Livonian lands against Liv insurrection when reinforcements could not reach Riga. The Danes landed in Livonia, built a fortress at Reval (Tallinn), and set about conquering Estonian and Livonian lands. The Germans attempted, but failed, to assassinate Valdemar. Albert was able to reach an accommodation a year later, however, and in 1222 Valdemar returned all Livonian lands and possessions to Albert's control. Albert's difficulties with Riga's citizenry continued; with papal intervention, a settlement was reached in 1225 whereby they no longer had to pay tax to the Bishop of Riga, and Riga's citizens acquired the right to elect their magistrates and town councilors. In 1226, Albert consecrated the Dom Cathedral, built St. James's Church and founding a parochial school at the Church of St. George. In 1227, Albert conquered Oesel, and the city of Riga concluded a treaty with the Principality of Smolensk giving Polotsk to Riga. Albert died in January, 1229. He failed his aspiration to be anointed archbishop but the German hegemony he established over the Baltics would last for seven centuries. 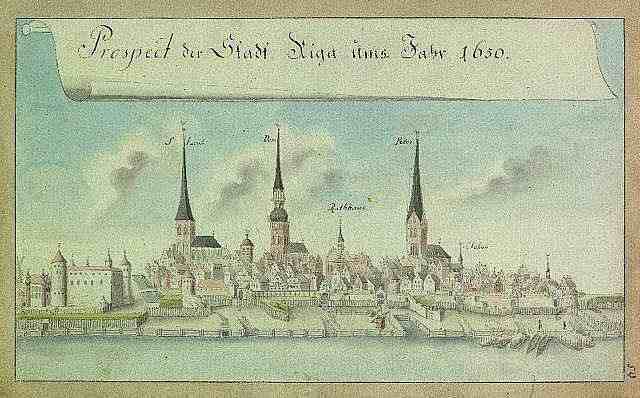 In 1282 Riga became a member of the Hanseatic League. The Hansa was instrumental in giving Riga economic and political stability, thus providing the city with a strong foundation which endured the political conflagrations that were to come, down to modern times. As the influence of the Hansa waned, Riga became the object of foreign military, political, religious and economic aspirations. Riga accepted the Reformation in 1522, ending the power of the archbishops. With the demise of the Teutonic Knights in 1561, Riga for twenty years had the status of a Free Imperial City, then in 1581, Riga came under the influence of the Polish-Lithuanian Commonwealth. In 1621 Riga and the outlying fortress of Daugavgriva came under the rule of Gustavus Adolphus, King of Sweden, who intervened in the Thirty Years' War not only for political and economic gain but also in favour of German Lutheran Protestantism. During the Russo-Swedish War, 1656-1658, Riga withstood a siege by Russians. Riga remained the largest city in Sweden until 1710 during a period in which the city retained a great deal of self-government autonomy. In that year, in the course of Great Northern War, Russia under Tsar Peter the Great invaded Riga. Sweden's northern dominance ended, and Russia's emergence as the strongest Northern power was formalised through the Treaty of Nystad in 1721. Riga was annexed by Russia and became an industrialised port city of the Russian empire, where it remained until World War I. By 1900, Riga was the third largest city in Russia after Moscow and Saint Petersburg in terms of numbers of industrial workers. During these many centuries of war and changes of power in the Baltic, the Baltic Germans in Riga remained in their dominant position despite demographic changes. By 1867 Riga's population was 42.9% German. Riga employed German as its official language of administration until the imposition of Russian language in 1891 as the official language in the Baltic provinces. Latvians began to supplant Germans as the largest ethnic group in the city in the mid-19th century. The rise of a Latvian bourgeoisie made Riga a centre of the Latvian National Awakening with the founding of the Riga Latvian Association in 1868 and the organisation of the first national song festival in 1873. 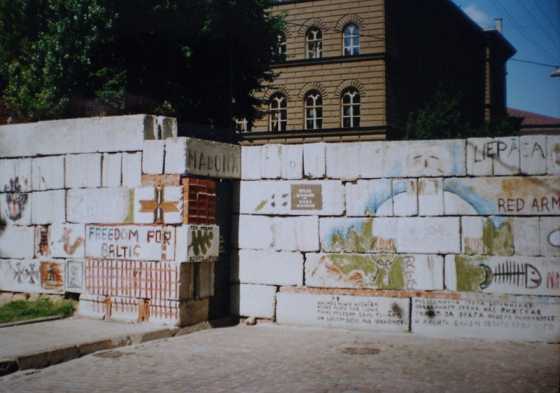 The nationalist movement of the Young Latvians was followed by the socialist New Current during the city's rapid industrialisation, culminating in the 1905 Revolution led by the Latvian Social Democratic Workers' Party. The 20th century brought World War I and the impact of the Russian Revolution of 1917 to Riga. The German army marched into Riga in 1917. In 1918 the Treaty of Brest-Litovsk was signed giving the Baltic countries to Germany. Because of the Armistice with Germany of November 11, 1918, Germany had to renounce that treaty, as did Russia, leaving Latvia and the other Baltic States in a position to claim independence. Latvia, with Riga as its capital city, thus declared its independence on November 18, 1918. Between World War I and World War II (1918–1940), Riga and Latvia shifted their focus from Russia to the countries of Western Europe. The United Kingdom and Germany replaced Russia as Latvia's major trade partners. During the World War II, Latvia was occupied first by the Soviet Union in June 1940 and then by Nazi Germany in 1941-1944. The Baltic Germans were forcibly repatriated to Germany. 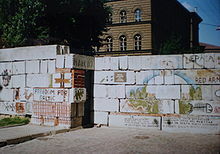 The city's Jewish community was forced into Riga ghetto and concentration camps were constructed in Kaiserwald and the city of Salaspils. In 1945 Latvia was once again occupied by the Red Army. As a result of the war Latvia lost approximately one-third of its population. Forced industrialisation and planned large-scale immigration of large numbers of non-Latvians from other Soviet republics into Riga, particularly Russians, changed the demographic composition of Riga. The policy of economic reform, introduced in 1986 as Perestroika, led to dissolution of the Soviet Union and restoration of independent Latvia in 1991. Latvia formally joined the United Nations as an independent country on September 17, 1991. In 2004 Latvia joined both NATO and the European Union. * The Lutheran cathedral, the largest church in the Baltic states. Built in the 13th century, it was modified several times in its history. It has a magnificent organ that dates from 1844. * Riga Castle (Rīgas Pils), which houses the Museum of Latvian History and the Museum of Foreign Art, and the president's official residence. * Saint Peter's Church, Riga, with its 123 m (404 ft) high tower. * St. John's Church, a small 13th-century chapel, behind Saint Peter's Church. * The Powder Tower (Pulvertornis), the only tower that remains from the original city walls. The Latvian Museum of War is located inside. * St James's Roman Catholic cathedral. * Latvian Ethnographic Open Air Museum is an Open-Air Museum (Brīvdabas Muzejs), displaying houses, farm buildings, and church representing rural life going back hundreds of years. Situated along Jugla Lake (Juglas Ezers). * The Museum of the Occupation of Latvia, which documents the seizure and occupation of Latvia by various invaders from 1940 to 1991. * Art Nouveau architecture on Central Riga streets such as Alberta and Elizabetes iela. * Riga Radio and TV Tower - the third highest tower in Europe. * Riga Motor Museum - collection of retro motorcycles and automobiles, including some of the first motorcycles and remnants of the Soviet era, for example, Brezhnev's and Stalin's armoured limousines with waxworks of these political figures. * Riga Zoo and Mežaparks (Forest Park) with a Ferris wheel. * Riga Circus — the only permanently situated circus in the Baltic States. 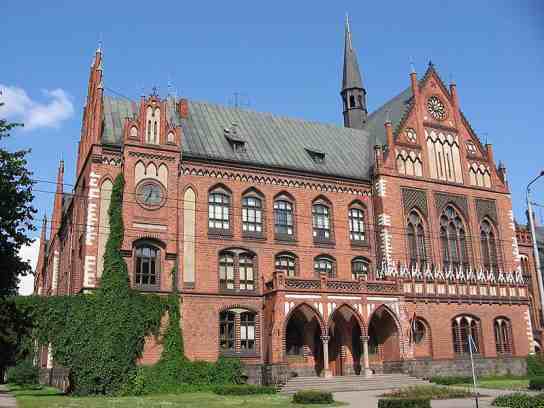 * Riga Museum of History and Navigation - one of the largest and oldest museums in Latvia and Baltic states. * Vērmanes Garden - the oldest public garden in Riga. 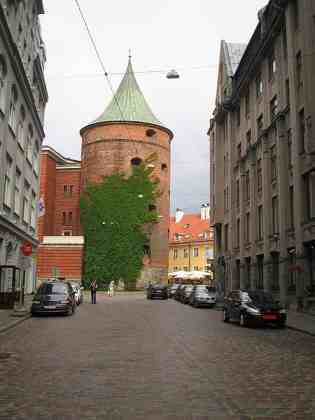 * The Powder Tower of Riga Left-bank Riga is distinguished by its green streets and large parks. * The city of Riga consists of six administrative regions, four of which are named after regions of Latvia - Kurzeme district, Latgale suburb, Vidzeme suburb, Zemgale suburb. There is also a Central District and a Northern district. Residents, however, divide Riga into residential neighbourhoods called micro regions. Unlike the city centre, they are mostly residential although they are equipped with commercial sectors. 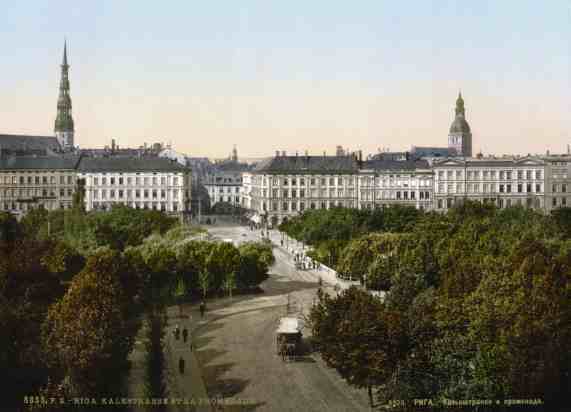 * Āgenskalns - Left bank, old neighbourhood, mainly built in late 19th — early 20th century. * Andrejsala - An emerging art, culture and entertainment district, located within former territory of the industrial port. * Beberbeķi - A neighbourhood consisting mainly of private houses, it lies on the western edge of the city. 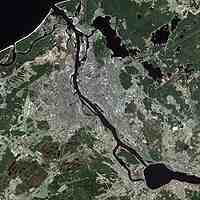 The swampy forest Mukupurvs and Riga Airport noise area separate it from the rest of the city. * Bolderāja - Left bank, northernmost neighbourhood. The 18th-century fort built by Peter the Great is one of the oldest buildings in this part of the city. 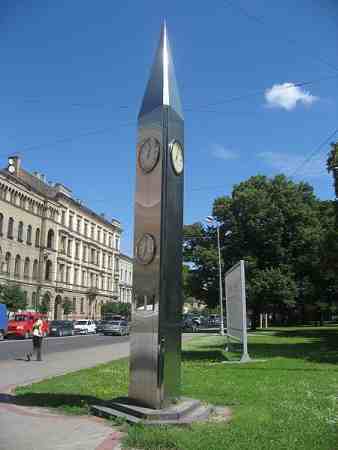 * Čiekurkalns - Right bank, old neighbourhood. * Dārzciems - Right bank, mainly consists of one or two-storey private houses. * Dreiliņi - A newly built neighbourhood in the eastern part of the city. * Dzirciems - Left bank, south of Iļģuciems. * Iļģuciems - Left bank, north of Āgenskalns. * Imanta - Left bank, newly built neighbourhood. * Jugla - Right bank, large neighbourhood, lies just west of lake Juglas. * Ķengarags - Right bank, south-east of city centre. One of the most populous neighbourhoods in town. * Ķīpsala - island located just west of the Old Town. Home to the Press Office and Exhibition Hall. * Maskavas Forštate - located south of the city centre. * Mežaparks - Right bank, consists largely of private houses. Notable for its large forest-like park including the Esplanade where the Folk Song Festival is held and also the city zoo. * Mežciems - Right bank, just east of the large Biķernieku forest. * Pārdaugava - City's part, situated on Daugava's left bank, meaning "across Daugava", also particularly the neighbourhoods along the water, Āgenskalns and Torņakalns. * Pleskodāle - A neighbourhood consisting mostly of private houses on the west side of the city. It borders Zolitūde and Šampēteris neighbourhoods. * Pļavnieki - Right bank, one of the town's most populous neighbourhoods. * Purvciems - Right bank, one of the town's most populous neighbourhoods. * Sarkandaugava - Right bank, east of the small river with the same name. * Šampēteris - An old neighbourhood on the left bank of Daugava, with many houses built in the first part of 20th century still surviving. * Šmerlis - Right bank, more of a forest than a neighbourhood, it is home to Riga's Cinema Studio. * Torņakalns - Left bank, old neighbourhood known for the Māras pond. * Vecmīlgrāvis - Right bank, cut off from the mainland by a small river, Mīlgrāvis. * Vecrīga - Old Town. 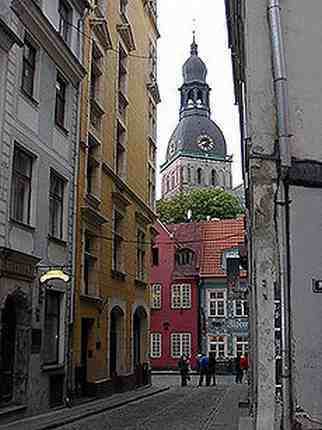 * Ziepniekkalns - Left bank, consists both of old and new buildings. * Zolitūde - Left bank, another newly-built neighbourhood, just south of Imanta. Some common factors in these place names are "vec-" meaning old [vecs], "-kalns" meaning hill, "-ciems" meaning hamlet, "-sala" meaning island and "mež-" meaning forest [mežs]. in both cities The Powder Tower of Riga. This page was retrieved and condensed from (http://en.wikipedia.org/wiki/Latvia) November 2009.